When your baby is matured enough to eat solid food at the age of four to six months and when he can sit up without help, a portable high chair serves as a safe platform to experiment with tastes and textures. Besides serving as an experimental platform for your child that is starting to feed on solid foods, it makes it easy for you to monitor your child as he eats and easy to clean up after meals as well. There are different types, styles and sizes of portable high chair. Padded seats are easier for the baby to sit on. 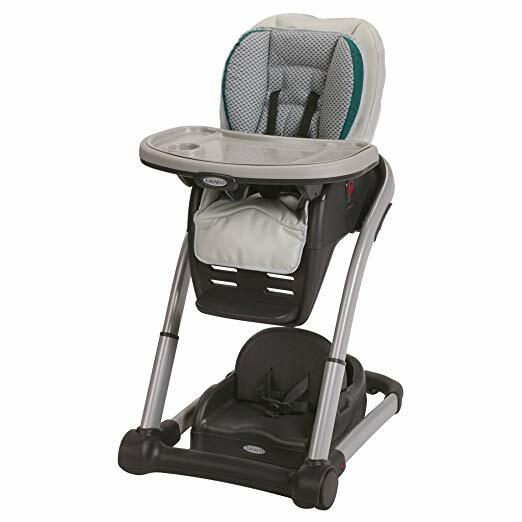 Portable high chair with wheels can be used any where either in the bedroom, in the kitchen or in the dining room. Always ensure that the wheels lock to prevent accidental roll-always. It is better to choose chairs that are solid and easy to clean and which will last for a number of years. Your baby will be required to make use of the portable high chair until he is about three years old. The OXO tot is the best overall portable high chair in our list of portable high chair, 2017. It helps your child to transit smoothly from being fed to feeding himself. It comes in a very sturdy and stylish design. It is made up of wooden design and a seat that saves a lot of space and can readily get blended into any form of home decoration. It provides extra comfort for your child. The seat, back and cushions of the portable high chair are contoured to provide additional comfort. It can be adjusted for your child to sit upright while eating. Also, the five harness feature secures the child firming while sitting during meals. It can be put into versatile use and is highly convenient. You can use it as an infancy chair when your child is in a sitting position and when you adjust the seat to the lowest setting. You can use it as a crotch-post when the tray and straps are taken out. The OXO Tot comes with a comparatively large recess tray that can hold up to seven ounces of spilled liquid. With such a capacity, your house’s floor will remain clean and free of liquid spills. It is also compact for easy storage and stable when placed on the table. With up to three levels of tool-free height adjustment, you can put this chair under diverse tables of different heights. The depth adjustability ensures that the chair grows with your kid. It can be used by your child till he is five years old. It features a lot of safety features that keep your child safe. It is made up of a very sturdy construction. The Peg Perego Siesta comes in a stylish design. If you are color conscious, you’d be glad to know that the peg perego portable high chair comes in a wide variety of colors. The main focus of this portable chair brand is the provision of suitable comfort to your child no matter the design you chose. The Siesta portable chair is very easy to clean. It is structured with Prima Classe fabric that is easy to clean with a wet cloth. 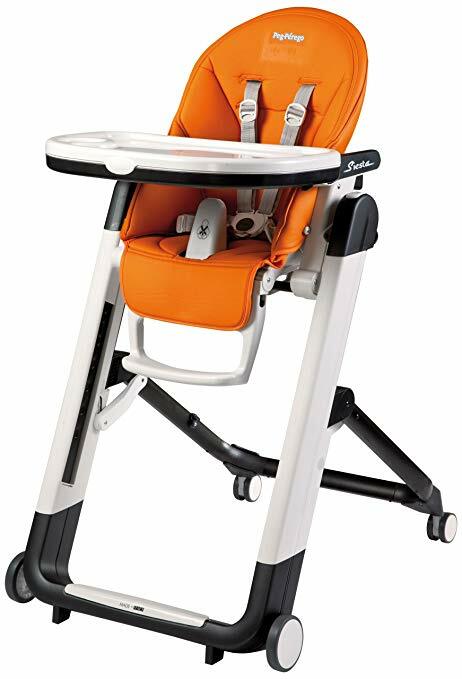 The perego Siesta portable high chair is made up of 70 percent polyester and 30 percent cotton. It comes in five reclining seat positions and features a tilt-in-space seat that completely reclines to provide maximum comfort for your baby. It comes in nine different height positions which allow you to adjust it based on your baby’s age and size. Thus, you can use it when your baby is just starting out to eat solid foods at the age of 4 to 6 month till when your baby is 3 years old when he needs to get off the portable high chair. It also features Mar-resistant caster wheels which automatically lock to keep your child always safe. It comes in extremely compact, standalone fold and in a small foot print which ensures that it does not take much space. It is thus, the best travel high chair or best chair for use in any place with space constraint. It is structured with the baby needs in mind. The sensitive Design can easily be configured. Thus, you can readily adjust the portable high chair to a lower position and recline it for your baby to rest or put in upright position for your baby to sit in upright position during meals with much ease. It comes in a stylish and compact design and does occupy much space. The portable high chair has a lot of excellent features like the nine height sizes and the complete reclining feature which provides your baby with maximum amount of comfort and safety. It is cost-effective and provides enough value for the cost. It is built with study materials which mean you can use it for many years. Few users of this portable high chair think that the locking system is not user-friendly. Blossom 4 in 1 portable high chair is structured to grow with your child. It is made up of four exclusive modes that allow tour kid to be comfortable at mealtime during different stages of his development. The Graco Blossom 4 in 1 comes in an innovative design that makes it possible for two to use it at the same time. 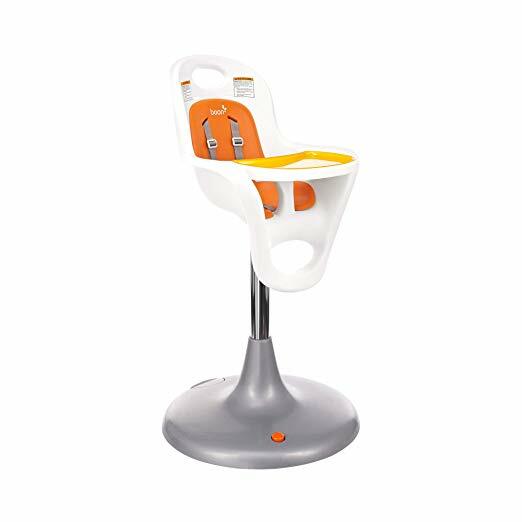 The portable high chair can also be used as a high chair and a toddler booster concurrently. This implies that the chair can serve as a feeding booster and as an early life chair for your child simultaneously. This feature is what made Graco Blossom portable high chair of the best portable high chair for camping. You can adapt the Blossom 4 in 1 to suit the needs of your child. It comes in a six height position and three recline planes which allows you to get a comfortable position for your kid and the right height for mealtimes. The adjustable setting makes it suitable for kids of 4 months to 3 years of age no matter their size. You can adjust it to a comfortable sitting position or dining position. The portable high chair features a detachable tray for easy operation when your hands are full. The tray can easily be attached and be removed with one hand and is dishwasher safe. It features a detachable back seat which provides your child with the required comfort with much ease. It come with suitable body and head support to provide your child with more comfort. The foot rest is made up of 3 adjustable positions. The Graco Blossom portable high chair may be relatively expensive for those wanting a cheaper alternative. 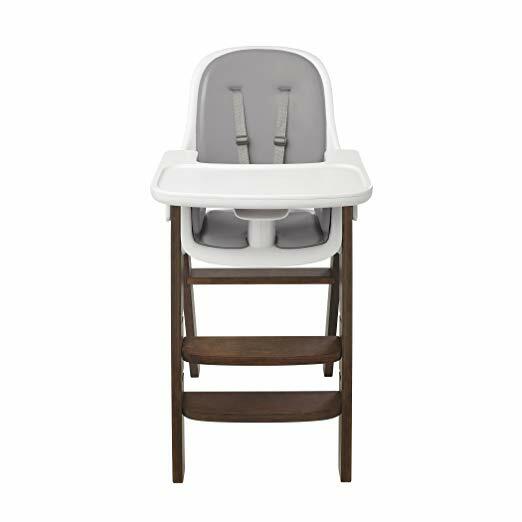 The boon flair pedestal portable high chair is a great choice for those who are looking for a portable high chair that that combines both comfort and style. The portable high chair seat of the boon flair portable high chair comes in one of the best flashy designs among baby high chairs. It comes in a smooth design and is exceptionally easy to clean. It features detachable seat pads that make the cleaning and maintenance of the chair easy. The seat also comes with a tray liner which is dishwasher-safe. The foot activated lift feature helps you to adjust the Boon Flair easily. To set the height of the seat all you need to do is to step on the lift, and the chair moves up or down depending on what your needs are. It has a versatility of use and can be used in multiple locations due to the stable base feature that moves smoothly in every direction. It features pedal breaking which provides fast single step breaking to give you more control over it. It is made of a stylish build without cracks or crevices. It is dish washer safe and the sleek design makes cleaning up easy. The pedal brake may not be effective especially if the baby is above average size. It teaches your child how sit on his own and helps him to feed independently. It gives your child early exposureto all forms of family food during the time the family sits together to have family dinner. It helps your child to develop a sense of self discipline and self regulation which helps him to stop feeding when he is full and avoid being overfed. Portable high chair gives your little kid an opportunity to feel more like a member of the family when he’s sitting next to the rest of you during family meals. Experts are always saying how important it is to have family meals at the table together. Portable high chair ensure that the habit is cultivated early. Another great reason for portable high chair is that they can be taken on vacation or to your favorite restaurant. Guide for buying the best portable high chair. There a lot of things you need to put into consideration when you are planning to purchase a portable high chair for your child. 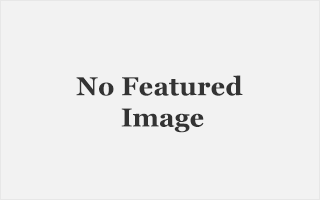 We have provided below the most important considerations that will ensure you get the product brand and model that is most suitable for your baby’s needs. To gain the most benefit from your child’s portable high chair, you need to get one that is age appropriate. The best choice of baby high chair is the one designed to grow with your little one. If you want to make use of the portable high chair on a day to day’s basis, try to get a model that is light weight and easy to assemble or disassemble. If your aim is to get one that your child will only use during a family get together, it is better to get one that is very solid and which can rotate in different directions. What you plan to spend on the portable high chair will ultimately determine your choice. However, check to ensure the portable high chair you decide to buy has all the features that you require. People who have used the products you want to buy would provide you with firsthand information you can trust about the product. So, do not forget to check out user reviews of your chosen product brand and model before you buy. Is the portable high chair safe? You should never compromise your child’s safety for style. Always ensure that the chair will be safe for your child before you buy. You need to get a portable high chair with a solid build. A heavy type needs to come with a large footprint to make it very stable. It is better to get the chair that is made of high quality materials to sufficiently support the weight of your child while standing or sitting down. The best portable high chair should come with a secure harness system. Try to choose a unit that features a five-point harness system with easy design and easy setup. The harness also needs to be customizable to meet your baby’s needs while at the same time allowing him slight movement on the chair. If you are going for folding or reclining baby high chair, it should come with a locking system. If you want to purchase a wheeled chair, you need to get one that has a locking system to prevent accidental movement of the chair. Does it come with a Crotch Post? A crotch post is basically attached to the feeding tray. A few units come with an incorporated crotch post. It is better to choose a portable chair with a built-in tray to ensure that your kid is safe even if you detach the tray. This will differ depending on your taste and requirements. However, you need to pay special attention to the size and your space constraints. The most convenient option is one that dethatches easily and fits into the sink or dishwasher for easy cleaning. Examine the seat, harness, tray and frame for difficult to clean areas. The portable high chair seat and harness ought to be easy to wipe clean or remove and be dish washer safe. The portable high chair needs to be adjustable to several heights to suit your child’s different age as he grows. The foot print’s size needs to be sufficient enough to make it stable. A chair with larger foot size is more stable. The portable high chair needs to be comfortable enough for your baby. The chair needs to be well padded to provide a good degree of comfort for your baby. The best chair ought to have a recline feature to allow your child to sleep comfortably after a meal. It will as well allow your child to rest after hours of sitting up. The ease of cleaning should be considered. It is better if it is machine washable to make cleaning easy. It should not be made with a stain resistant fabric to ensure that the material is easy to clean. The plastic high chairs are generally easier to clean but come with less padding. Try to get a wooden portable high chair that’s comparatively easy to clean. The portable highchair should be used occasionally during the day. The chair is majorly used during meal time or when the parent wants to teach the child how to sit in an upright position. As an ideal, you should never allow your child to sit more than one hour on the chair at any given time. Nevertheless, you should not allow not allow your child to stay on it longer than he desires. Also, you need to give you child enough time to finish his meal. With this and the rest of the information we have provided in this article, we are sure that you are now fully equipped with all the necessary information required to choose the best portable high chair for your kid. Remember that your child will not be requiring a portable high chair till when he is able to sit down independently around the age of four to six months.